Jillian Barber, photo by Scott Lapham. Jillian Barber, originally from England, grew up in Westerly, Rhode Island. She graduated from the Rhode Island School of Design where she studied ceramics with Norm Schulman and glass with Dale Chihuly. Barber has had a career in ceramic sculpture, mask making and costume design. She brings a passion for portraiture to her mythical and imaginary animals and figures, attending to form, texture, light and fantasy. She combines a deep reverence for nature with the realms of dreams, imagination, and archetype. Barber was costume and mask designer/maker for the Chorus of Westerly Celebration of Twelfth Night for 30 years. 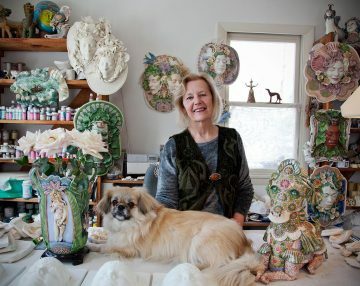 She received a RISCA Fellowship, numerous Katherine Forest Craft Foundation awards for excellence in ceramics and had a retrospective at the Newport Art Museum where her work is in the collection. Barber shows her work at Jessica Hagen Fine Art & Design and Charlestown Gallery. She lives and works in Jamestown. 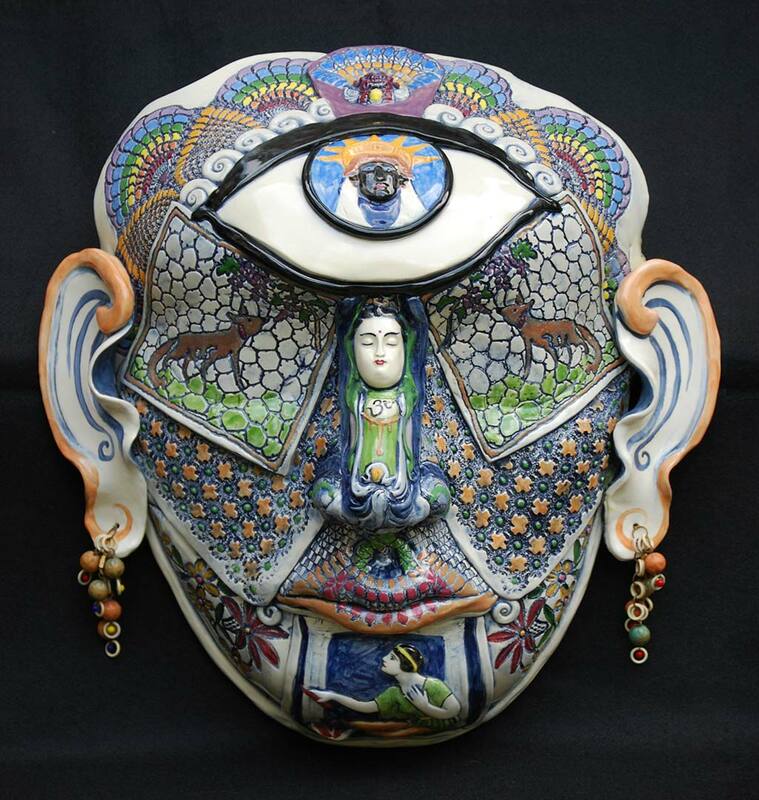 Earthenware with impressions of lace, underglaze colors, vintage beads, 20 x 20 in.